IsraAID provides desperately-needed supplies to refugees from ISIS, including baby milk and blankets, as winter misery intensifies. Israeli humanitarian workers have joined the effort to provide desperately-needed supplies to displaced victims of the brutal Islamic State terrorist group in northern Iraq and Syria. 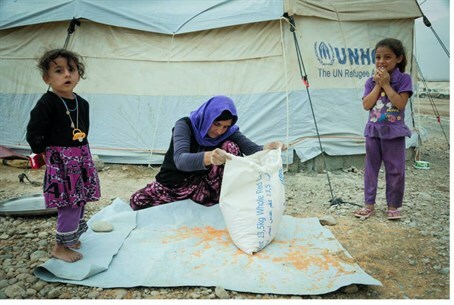 IsraAID supplied beds, blankets, and food to over 1,000 families in the Kurdish city of Duhok, in northern Iraq. The Israeli aid agency worked with Canadian ONEXONE to deliver a convoy to a 14,000-strong refugee camp carrying 2,000 blankets and mattresses, as well as enough powdered milk for all the 1,015 babies under one year of age. The emergency supplies could not have come soon enough. Many of those at the camp arrived with only the clothes on their back and are living in nothing more than tents or makeshift huts. As winter approaches their misery has increased still further, with recent rainstorms and cold weather just a harbinger of worse to come: some parts of the region receive a meter of snow on average amid subzero temperatures. IsraAID's Founding Director Shahar Zahavi told Arutz Sheva that the Israeli team were warmly received by the Kurdish residents of the camp. "They were aware that we were Israeli, and they received us very well. The Kurdish people really love Israel," he said. Indeed, the Jewish state has good - if somewhat covert - relations with the Kurdish Regional Government in particular, and many Kurds and Israelis see eye-to-eye on crucial issues such as the wave of Islamic fundamentalism sweeping the Middle East, which threatens both nations. IsraAID has provided aid to disaster zones across the world, from Haiti to Japan, and from the Philipines to South Sudan. But Zahavi explained that the mission to help Kurdish victims of ISIS resonated particularly strongly with them. As the Middle East's only full democracy, Israel has a special duty to aid the Kurds - who are the largest stateless nation in the region - in their struggle for freedom against Islamist forces, Zahavi said. The mission - which was the first of its kind by an Israeli aid agency - went smoothly enough, and was coordinated with the KRG. But aid workers soon witnessed the extreme conditions faced by refugee when a massive storm tore through the camp, flooding the entire area and destroying many of the tents. Duhok is part of the autonomous Kurdish region run by the Kurdish Regional Government (KRG), where nearly two million refugees - including Christians and Yazidis - have fled ISIS's genocidal military campaign. Although most refugees there were originally from parts of Iraq under attack or occupied by ISIS, as the battle for the Kurdish city of Kobane in northern Syria rages on, roughly 1,000-1,500 refugees from the city are arriving at the camp each day via Turkey, placing even more pressure on already-overstretched aid efforts.